Commencement of the company activities goes back to 1991 when a designing studio with parallel production and installation of the interiors ATIS was founded. In 1999 this company was transformed into the company ATIS-em spol. s r.o. The scope of the company activities includes design, production and installation of business, administrative, civil interiors and flats. The company ensures construction works, which precede realisation of the interiors including associated professions. A professional designing section offers architectonic and engineering services in the field of interiors, new constructions and reconstruction of civil structures and flats, comprehensive pre-realisation preparation and coordiation of all the professions. The company Atis-em co-ordinates and ensures comprehensive service during building-in sales units in shopping and social centres; it realises so called key-ready interiors, which includes elaboration of complete project documents including the approval (constructional part and interior), realisation of the construction part and complete installation of the interior. Within direct sale the company ATIS-em offers integrated program of business equipment for all ranges of goods. The individual elements of the business equipment can be seen in the company exhibition hall. The designing studio ensures studies, documents for zoning process, projects for issuance of building permit, construction realisation documents, and projects of interiors. Specialised projects are ensured in a form of co-operation with permanent external co-operators. The company carries on engineering activities for ensuring the zoning approval and building permit, technical supervision for the investors and author’s supervision. It co-operates during tenders for sub-contractors and during final inspection proceedings. 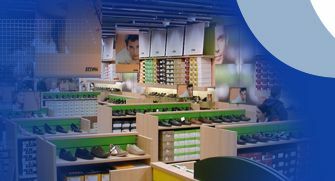 It co-ordinates and ensures implementation of building-in sales units in shopping and social centres in the Czech Republic and Slovak Republic. Comprehensive realisation of business and social interiors and flats. Co-ordination of trades, production, deliveries, installation, author’s and technical supervision. Sale, delivery and installation of general purpose BUSINESS EQUIPMENT for equipment of supermarkets and sales units of all ranges of food products and consumer goods. Business representation of OZT Toužim for Moravia. Comprehensive offer of services from creative designs of exhibitions, technical solution, up to realisation of key-ready exhibitions. All this includes graphic designs and realisation. Construction work and trades during comprehensive realisation of sales units in shopping and social centres, co-ordination of works, engineering, and construction supervision. Ensuring realisation of civil constructions and flats.